Most people are familiar with plants that are capable of producing their own plant available Nitrogen (CN, NH4, NO3) by converting unavailable Nitrogen (N2) from the atmosphere benefit from a symbiotic relationship with rhizobial bacteria species. This process is limited to the legume family. 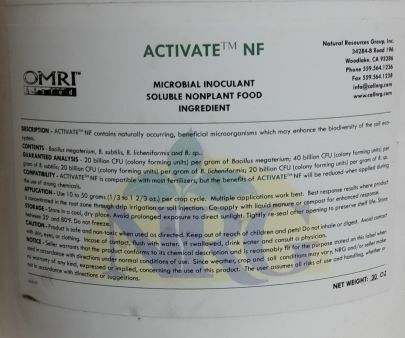 The Activate NF bacteria are free living in the soil and are especially active in the area of the root system. They can function independently and provide plant available N to any plant type. The Activate NF bacteria can be purchased alone in concentrated form but our recommendation is to purchase them pre-mixed with the Wake Up Organo food source. This approach gives the organisms a significant head start at the time of field application, allowing them to multiply quickly to the desired populations in the soil. All products in Activate Series from NRG are selected strains of single or multiple bacteria species.